While the furor over this topic seems to have died down, it is a topic that has been debated in the US for a good long time. When I was doing high school debate in 1986 it was the favored practice topic for forensic debate and had been for some time. It was debated when it was first imagined and has been off and on ever since. First, a quick recap of what the electoral college is. 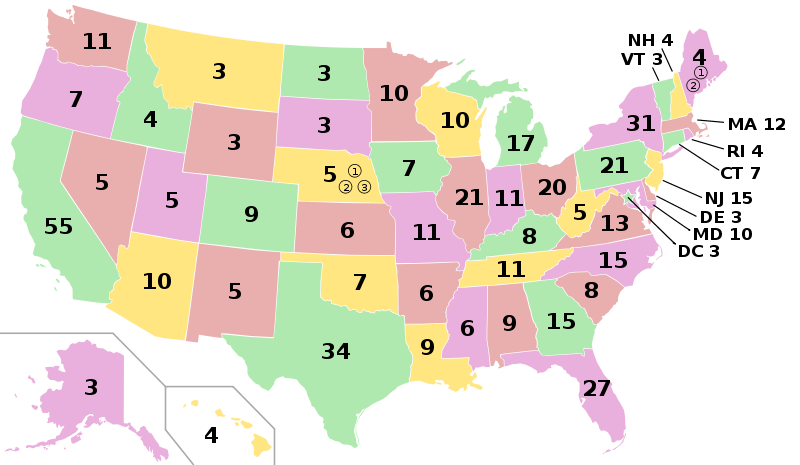 To elect the president, each state is assigned a number of delegates. It is these delegates who cast the deciding vote for the president. Every state is awarded a delegate seat for each member of congress they send to Washington. Every state has two senators for congress and a number of house members determined by their relative population. The total numbers of house members is fixed at 435 and each state is always granted at least one seat. The district of Columbia is awarded 3 delegates even though they don’t have true senators or congressmen (they have “shadow” versions of these). The result is that smaller states have more delegates per person than larger states. While representation in the house is proportional, the senate is not and low population states get as large a share of those as populous states. Also the fact that each state gets at least one house member also slightly skews the delegate per state count in favor of small population states. Each state get’s to decide for itself how they choose electors and how those electors are to vote. In most states, all the electors are required to vote for whatever candidate receives the most citizen votes in the state. In a few states, delegates are allocated proportionally to how the state voted. In some states, delegates are not legally required to vote according to the state’s votes. For practical purposes, state’s electors vote the way their citizens do in the election. There is no requirement that states award delegates based on popular vote. Prior to the early 1800s, many states simply had their congress choose delegates and who they would vote for. Today, every state’s delegates are based on popular statewide votes in some fashion. Before I look at the merits and problems with the system, I should say that I think it unlikely to change. It is part of the constitution, thus a systemic change to it requires amending the constitution. This first requires two-thirds of the congress and house to propose the change. Then it must be ratified by three-fourths (38) of the 50 states through their own legislative bodies. States can pre-empt congress by calling a constitutional convention, but this has never actually resulted in a successful constitutional amendment, so far, it always starts with congress. The way population is distributed in the US there are a few states with massive populations and a large number with middling or low populations. Far more states are below the average population than above it. This means that most states benefit somewhat from the electoral college in terms of delegate count vs population, and only a few suffer from it. Thus, were states to go with their own best interest, most would reject an effort to remove the electoral college. Because you need three-fourths of the states to ratify a change, the chances of this are slim to none. Where change is somewhat more likely is how states choose electors and how they insist that they vote. More states could shift to a proportional allocation. While this would somewhat change the outcome of votes, it is not a dramatic change and doesn’t address the core critiques of the electoral college which is that some American’s votes count more than others. So if it is highly improbable we will ever change the electoral college, why discuss it further? Partly, I think that debate of the topic educates people about how it works and the history behind it by making them care about the issue. Secondly, it promotes a general interest in how you are governed and that is, in my opinion, very important in a democracy. The case for the electoral college goes back to the founding of the country. The colonies that became the US were very independent minded and feared the kind of rule they were rebelling against from their new national government and from one another. There was a balancing act between the idea that each American had an equal stake in the nation, and that each state had an equal stake. The end result was a compromise wherein half the legislative government would be equal by state, and half would be proportional by population. The electoral college followed a similar pattern. Now in congress, the split is more powerfully in that both the senate and house must agree to enact legislation. That means the states are equal half has just as much power as the popular half. With the electoral college, they are all tossed together in one vote. Since the populous half outnumbers the equal power half, the populous influence is about 4 times as strong rather than roughly equal in influence. Understanding that each colony had its own history and culture is important to understanding the desire they had to remain somewhat independent and to retail local political sovereignty. If they were to cooperate, the smaller states would want a political tool to prevent larger states from bullying them in national politics. It was very true in the time that people within a state had a lot more in common than people within the nation as a whole. In today’s politics, we might think of it as a kind of affirmative action for low population states to ensure their minority status is not exploited. Some also argue that the electoral college serves as a bulwark against populism. Because it is possible for at least some electors to vote differently from the popular vote within the state, they could, in theory, oppose a popular candidate on some moral principle or other justification. For practical purposes, that has never happened. While some electors have decided to go their own way, it has never impacted the outcome of a presidential race. That brings up the question as to whether the disproportionate strength of small states has been practically effective. There have been five cases in US history (as of 2017) where a president was elected without winning the plurality of the popular vote. So while it is rare, it does happen and thus it is a meaningful system that does effectively give smaller population states an electoral advantage in selecting a president. People who feel that each citizen’s vote should count equally object to the electoral college because it makes the votes of citizens in small states count for more than the votes of citizens in populace states when electing a president. There is a democratic principle in the idea that each citizen’s voice is of equal strength and importance no matter where they happen to live within the nation. The other objection is that the nature of the electoral college makes it possible for the state’s citizens to be ignored entirely if electors choose to break from the popular vote. While it has not happened in any meaningful way, there is nothing to say that won’t change in the future. It is a system vulnerable to conspiracy. Unlike the proportionality, this critique can be solved within each state by changing how delegates are chosen and how they can vote. Thus it tends not to be as much of a focus in the debate at a national level. The same is true of the winner take all system most state’s employ. It has been cited as a problem in disenfranchising some voters and exaggerating the popularity of winning candidates while marginalizing others. This tends not to be a focus since each state makes its own laws on this point. Dominant political parties in states often prefer this method because it strengthens their presidential candidates. For starters, I don’t think it is likely to be changed unless we consistently have minority vote candidates winning office and there is a very significant public outcry. Because the decision lies in the hands of those benefiting from the arrangement, it is near impossible to alter. Thus it is a largely academic question. That’s never stopped me from having an opinion! In principle, I am more of a mind to side with the idea that each individual in the nation is entitled to representation than each region or state is entitled to representation. I’ve never been one to strongly identify with any given state and certainly not with its government. I’ve lived in two for long periods (Alaska and Washington) each pretty unique in its politics and culture. Even within each state, there are very different cultural enclaves. Citizens of the US are free to move from state to state any time they like. As of writing this article, I live on the road traveling from state to state for more than a year now. I also think that there is something unique about the president. He is a single man that represents all the people of a united nation. Not a hodge-podge of states and local interests. I think the spirit of the office is such that he should be the leader of all Americans equally both functionally and symbolically. Again, it is my general feeling I am a US citizen first, and a state citizen a very distant second, and not everyone feels that way. I would argue that as time has gone on Americans by and large feel this way more commonly than they used to and I suspect it is a trend that will continue. We started with people of entirely separate colonies founded by different religions from different nations as bastions of their faith or private business ventures. As time has gone on we have more and more melded into a single nation. At the same time, I do recognize that people in one region of the country have different interests and needs than those in other areas of the country. Furthermore, people in rural areas have very different needs and concerns than those in urban areas. There is a real danger in allowing the populated cities to have complete electoral dominance over people in the country. A policy good for one may be terrible for the other. The cities have a natural advantage under the one man one vote rubric so how do you ensure representative governance for those in rural areas? I feel that the best structural protection for rural voters comes from limits to federal power, that is the scope of policies and decisions they can make and impose on local areas. I have some sympathy with those who fear an over aggressive and broad federal government in some areas. National minimum wages are a good example. What is reasonable in a big city may be really high in a rural town and vice versa. Such matters are better when each local area can adjust the specifics to their needs and circumstances. I think we must have both hard line jurisdictional boundaries and a wisdom among the elected that it is best not to ignore the needs of voters, even if they are a minority of your constituency. I also feel that the structure of Congress is a much stronger and effective protector of states rights than the electoral college. Not only does congress have arguably greater power over matters that directly affect states disproportionately, the power of the senate is equal to that of the house giving state equality an effective veto on policy in every case as where the electoral college only delivers on its small state bias on rare occasions. To change congress would be a massive weakening of the state authority compared to changes in the electoral college. Were the electoral college a more powerful force in protecting rural voters, I’d have more sympathy for it. Since it is a weak and often innefective bulwark, I find the case for it weak as well. Ultimately, while I would support a change to abolish the electoral college, I think the arguments for doing so are too weak to affect the dramatic change that would be needed to do so. Instead, I would encourage the residents of individual states to reform their selection of delegates to be as democratically minded as possible. So while it is a great topic for debate, I think it is a poor topic for political activism. Democracies, Republics and Federations oh my!